As I arrive at this historic edifice, I thank God for this opportunity to be on Peruvian soil. I would like my words to be a message of greeting and esteem for each of the sons and daughters of this people, that down the years has preserved and enriched the wisdom handed down by its forebears and represents, indeed, one of its greatest legacies. I thank Mr Pedro Pablo Kuczynsky, President of the Nation, for his invitation to visit the country and for his words of welcome offered on your behalf. My visit to Peru has as its theme: “United by Hope”. If I may say so, seeing this land is itself a reason for hope. Part of your territory includes the Amazon, which I visited this morning. It is overall the largest tropical forest and the most extensive river system on the planet. This “lung”, as it has been called, is one of the world’s regions of great biodiversity, as it is home to a vast variety of species. Yours too is a wealth and variety of cultures, which increasingly intermingle and which make up the soul of this people. It is a soul characterized by ancestral values such as hospitality, esteem for others, respect and gratitude for mother earth and creativity for new initiatives. It is marked likewise by a shared sense of responsibility for the development of all, joined to a solidarity that has often shown itself in your response to different disasters you have experienced. In this regard, I would like to point to the young. They are the most vital gift that this society possesses. With their dynamism and enthusiasm, they promise, and encourage us to dream of, a hope-filled future, born of the encounter between your lofty ancestral wisdom and the new eyes that youth offers. I also take pleasure in a historical fact: that hope in this land has the face of holiness. Peru has given birth to saints that blazed paths of faith for the entire American continent. To name just one, Martin de Porres, a son of two cultures, showed the strength and richness that comes about when people focus on love. I could continue at length with this list of reasons, material and spiritual, for hope. Peru is a land of hope that invites and challenges its people to unity. This people has the duty to maintain unity, among other things, precisely to defend all these reasons for hope. Yet over this hope a shadow is growing, a threat looms. “Never has humanity had such power over itself, yet nothing ensures that it will be used wisely, particularly when we consider how it is currently being used” (Laudato Si’, 104). This is evident in the way that we are stripping the earth of its natural resources, without which no forms of life are possible. The loss of jungles and forests means not only the loss of species, which could also be extremely important resources for the future, but also the loss of vital relationships that could end up altering the entire ecosystem (cf. ibid., 32). In this context, being “united in defense of hope” means promoting and developing an integral ecology as an alternative to “an outdated model of development [that] continues to produce human, societal and environmental decline” (Urbi et Orbi Message, Christmas 2017). This calls for listening to local persons and peoples, recognizing and respecting them as valid dialogue partners. They preserve a direct link to the land, they know its times and ways, and so they know the catastrophic effects produced, in the name of development, by many projects. The vital fabric that constitutes the nation is thus being altered. The degradation of the environment, sad to say, cannot be separated from the moral degradation of our communities. We cannot think of these as two separate realities. For example, black market mining has become a danger that is destroying people’s lives; forests and rivers are being destroyed, with all the richness they possess. This whole process of degradation brings with it and encourages organizations operating outside of legal structures; these debase so many of our brothers and sisters by subjecting them to human trafficking (a new form of slavery), irregular employment and crime… and to other evils that gravely affect their dignity and, at the same time, the dignity of the nation. Working together to defend hope demands that we remain very attentive to that other, often subtle form of environmental degradation that increasingly contaminates the whole system of life: corruption. How much evil is done to our Latin American people and the democracies of this continent by this social “virus”, a phenomenon that infects everything, with the greatest harm being done to the poor and mother earth. Everything being done to combat this social scourge deserves our utmost attention and help… This is a battle that involves all of us. Being “united in defense of hope” requires a greater culture of transparency among public entities, the private sector and civil society. No one can be excluded from this process. Corruption is preventable and calls for commitment on the part of all. I encourage and urge all those in positions of authority, in whatever sphere, to insist on this path in order to bring your people and your land the security born of feeling that Peru is a place of hope and opportunity for all, and not just for a few. In this way, all Peruvians can feel that this country is theirs, that here they can relate fraternally and equitably with their neighbours, and help others in their need. A land where they can realize their own future. And in this way to forge a Peru that makes room for people of “all bloods” (José María Arguedas, Todas las sangres, Buenos Aires, 1964), a land in which the “the promise of Peruvian life” (Jorge Basadre, La promesa de la vida peruana, Lima, 1958) can be achieved. 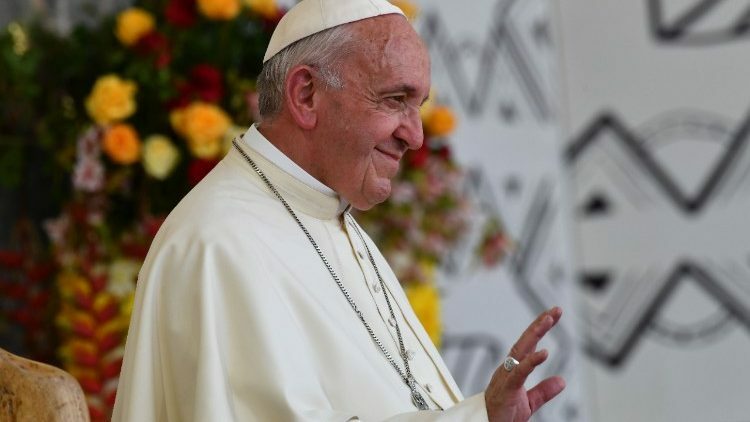 I wish to renew in your presence the commitment of the Catholic Church, which has accompanied the life of this nation, in this joint effort to continue working so that Peru will continue to be a land of hope. May Saint Rosa of Lima intercede for each of you and for this blessed nation.